The second day we got up early and hit it hard. Tried a completely new area that was full of classic sharptail habitat. 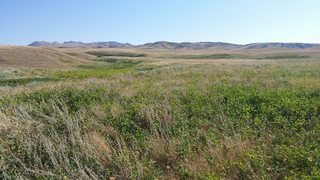 Rolling hills of native grass and 10 to 20% sage mixed in with buffaloberry draws, bordered by alfalfa fields. I mean, literally the stuff sharptail hunter's dreams are made of. 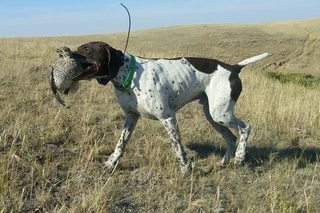 Rowdy would roll towards the buffaloberry draws heading towards the oh-so-familiar objectives he remembered from his time living in North Dakota. He hit all the right spots. And the only thing produced was dozen or so pheasant out of a buffaloberry and snowberry draw. With 3 or 4 hours of daylight remaining I drove 45 minutes to a new area we had not hit yet. It was actually a tip from the game warden, who checked me and chit chatted for a while before I hit BMA with Rowdy. Super nice guy and he said that it looked like nice sharptail stuff to him and so I thanked him and headed there. Upon getting there I saw that indeed it was really nice stuff. Rolling hills of native grass with deeper buffaloberry draws. Also bodered by cut wheat fields. Very nice habitat. 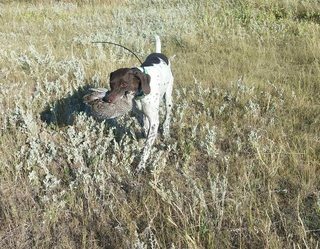 Rowdy and I hunted it for 2 hours, covering all the likely spots birds would be without finding anything. 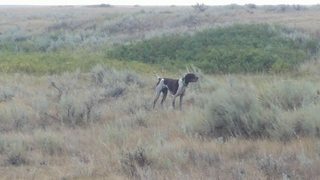 After we had turned to hit some new habitat on the way back to the truck, I watched Rowdy drop down into a coulee. Moments later the Garmin beeped and indicated Rowdy was either on point or taking a dump. I walked the 200 yards or so to catch up with him and indeed found him locked up. 2 sharptails flushed and I shot one of them on my second shot. After reloading 2 more flushed and I shot the first one on my first shot. No more birds flushed. A small 4-bird covey. He put in 23.9 miles on the Garmin that day. Sounds like you two made the most of your trip. 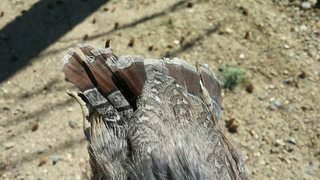 Nice job with the camera, enjoyed your hunt recap and your photos. Keep em coming. Do you use a gas stove for cooking? Bring pre-prepared meals or cook in camp? See any waterfowl while you were hunting? AverageGuy wrote: Sounds like you two made the most of your trip. Nice job with the camera, enjoyed your hunt recap and your photos. Keep em coming. I do bring a gas stove and cook very simple camp meals on it. 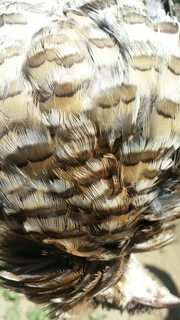 One of my favorites is fresh sharptail grouse wrapped in foil with onions, potatoes, garlic, butter, rosemary and salt and pepper. Cooked over low heat. But I also did drive the 45 miles back to town one night to enjoy a nice burger with everything on it and a beer. 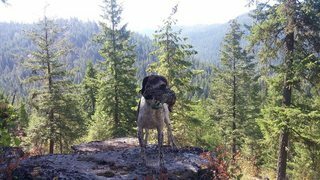 I also bring blocks of cheese and smoked summer sausage with me for easy dinners to be washed down with a couple of beers at camp. And yes I saw enough waterfowl potholes to spark my contemplation on a return trip for Fall ducks and geese. Eric: Know some guys up in that country right now but no word on how they're doing. Maybe Greg will post something? Your account makes me all warm and fuzzy. I'm going to do a drive through above Ft. Peck Res. in a couple of weeks to check in with the hunters. Sounds like a fun trip. 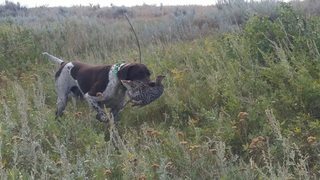 I'm skipping the trip to MT this year, instead heading to WY in a few weeks for ruffies, blues, waterfowl, and most importantly sage grouse. Hope to get some good pics also. That looks like a good time! Enjoyed the pics. Good looking country! orhunter wrote: Your account makes me all warm and fuzzy. Oh yeah it's just so warm and fuzzy up here in North Idaho. 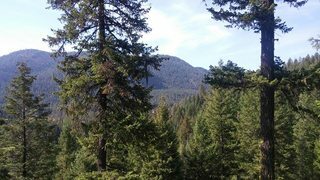 In fact, I was just contemplating how warm and fuzzy it is up here while being charged by a large, pissed off bull moose today, grouse hunting. I'm taking a drive up the Clearwater on the 20th. Last time through there, a moose was in the road up on top. Chased it down into MT, wouldn't leave the road. They are like squirrels up here... but angrier and more stubborn... and they do more damage to your truck when you hit them. orhunter wrote: I'm taking a drive up the Clearwater on the 20th. Last time through there, a moose was in the road up on top. Chased it down into MT, wouldn't leave the road. What are you doing up that way? Fishing? Hunting? Looks like an awesome start to the season! Keep the reports coming! Eric: Scouting trip to line up accommodations for hunting in November. Need to get the wife unit (and me) away from the big city. That sounds like fun Harvey, and yeah I know what you mean about needing to just get away. Keep an eye on your dogs in that Clearwater country. Lots of wolves and other critters around. Got no dog(s).... So sad. My wife says to me yesterday, "is there a dog going along with us?" Odd she would ask...... Don't ask me how many times I've made a drive like this with that ugly thing sitting next to me on the seat. Dang I miss that....... If we didn't have a final stop that involved other people, I'd drive over to KJ's and grab something that wants to go for a ride. Wouldn't be picky..... Have a back seat for wife unit...... Dog might like that....? Orhunter said "got no dog(s).... So sad". That is a tough predicament to be in this time of year I can relate to. Hopefully you have started running the traplines looking for a puppy. 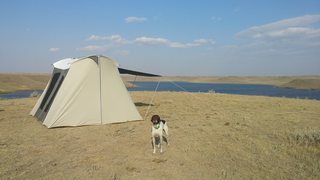 I found myself enduring a season without a dog. I had waited too long to get in line for what I wanted as my old dog aged. 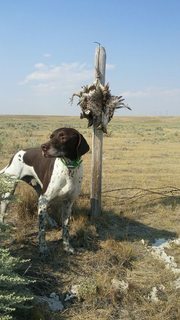 I remember explaining my predicament to Bob Farris "no bird dog equals no bird hunter"..... I leaned on my friends for periodic fixes to ease the anxiety and was grateful, but it's not the same as loading up with the dog and hunting when and where you fancy....I feel your sadness.